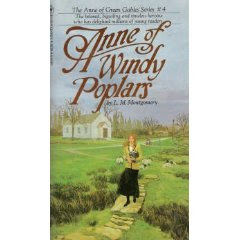 Ahhh, I finally made it through Anne of Windy Poplars which I confess I had to lay aside for about a week simply because the book was getting on my nerves and I lacked the will power to finish it immediately. I have always had a hard time with this particular title because you can tell that Montgomery was just flat out bored with Anne and didn't want to be writing about her - again. To give you a quick summary of the story: Anne is off to teach at Summerside High School (which, those of you who have watched Anne of Green Gables - The Sequel will recognize as Kingsport Ladies' College.) Kevin Sullivan pulled a lot from Windy Poplars and plugged it into the movie sequel. This book is about Anne's time among the Pringles. Instead of being written in the third person, it is mostly comprised of letters which Anne is writing to Gilbert. She "dear-ed" and "darling-ed" and "beloved" him to the very death of all of us in this book and it begins to grate on one's nerves after a bit! I agree, Anne. I agree! Ever feel like you are dealing with someone with the highs of exclamation points and the lows of italics? I thought this was kind of clever on the part of Montgomery. At the same time - that's all I've got from this book: her way of explaining personalities through punctuation and grammar. Ah well! I'm grateful that in the next book Anne and Gilbert get married and, as Anne describes with wonder near the end of Windy Poplars - there will be no more need for any letters between them. I've known of people who seem to talk all in exclamation points, and I've wondered what they do when they're really excited. I also wonder how they wrote in italics when writing by hand. More of a slant, I guess. I admit that I do love italics. But, I tire of them and sometimes just do this....which in my own mind means the same thing. I carry on more than one conversation at a time also and the italics are like doing that in print. You have to admit though, what Gerald and Geraldine did to Pamela Drake was amusing. This reminds me of a Stephen Wright joke where he talks about days where he feels very quiet as days when he's in parentheses. I always found it interesting--though I missed it the first time around as a teen--that the Anne books are written all out of order. 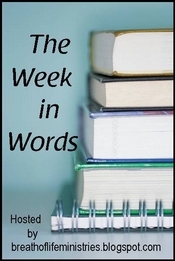 Anne of Windy Poplars and Anne of Ingleside are both written after all the other Anne books. Anne's House of Dreams, Rainbow Valley, and Rilla of Ingleside all were written and published before this one. I love Anne and I even enjoyed this book, although I think it would have been better without the letters. I wondered, like Barbara H, how Anne would write in italics since she was using pen and ink. I've always liked this book, believe it or not. Something about all the minor characters (although I guess in this book they're actually major characters, huh?). I wonder if the Pringles would annoy me as much in the book as they did in the series. LOL. I've been know to use a few too many exclamation points myself. I haven't gotten to this one, yet. Up next for me is Island. I'm surprised you didn't like a book of letters, since you adore Guernsey as much as I do. ;-) Then again, that's an exceptional book!!!!! This was one of my least favorite Anne books also. I didn't remember that it was written in letters to Gilbert which could explain why I didn't love it as much. Mostly I found the characters less likeable. Those Pringles!! Nope, Windy Poplars was not my favorite Anne. Actually, if truth be told, the older Anne got, the less I liked the novels. Do love the italics quotes! Once again checking your review after posting mine. I hadn't caught that LMM didn't name Diana's baby -- that's sad. And I just saw somewhere that this was written after the other books? I wonder why -- just to fill in the time gap? Or to make a place for characters in her head that she had no other place for? This wasn't my favorite as well.